Bizarro cartoons are, as the name suggests, a little strange. But I simply do not get this cartoon from January 31. Utterly obscure to me, too. Presumably, some riff on the concept of the various unknown soldier monuments, but perhaps something to do with Shelley’s Ozymandias. John Morales, this cartoonist always puts various objects in the frame. They’re unrelated to the main image, just something for the fans to find. There’s a third one, too: the letters “K2” on the man’s shirt. 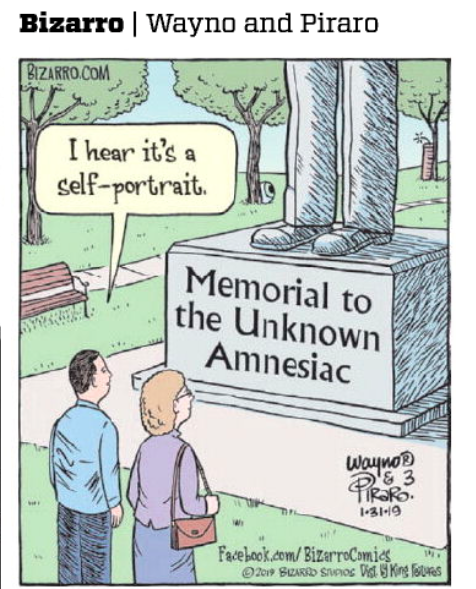 The way I interpret this one, the statue was made by an amnesiac (hence the “self portrait”), and therefore named it as s/he did since s/he him/herself is “unknown”. Yeah, the sculptor doesn’t know who they are, hence “unknown”. Thanks, DonDueed. I missed the K2, that’s well-integrated. So, not a rebus. If it is intended as you interpret it, then it’s pretty meh for me. This amnesiac was clearly a great man. Great meaning large or tall. Hence the size of the statue. But he didn’t remember anything about himself but the most pedestrian of things -- hence the statue being of his lower legs and feet. The Bizarro cartoonists always puts a few of a set of standard items in his cartoons. In addition too the eyeball and the K2, he also puts in a stick of dynamite (which you can see leaning against a tree), a slice of pie (not in this one), and a bird (also not in this one). They have nothing to do with the cartoons. I thought it was funny. The statue is a self-portrait of the amnesiac who has forgotten his name. I miss a lot of the Bizzaro cartoons but this, to my slightly twisted mind, was fairly obvious. Anyway, someone who makes their own self-portrait perforce cannot be unknown to themselves. Not just ‘amnesiac’, but furthermore ‘unknown’. Separate clauses, not synonyms. I often notice carelessness, both in myself and in others. In my previous, ‘themself’, not ‘themselves’, though mostly for the aesthetic of plurality concordance, just as Mano @6 used ‘he’ for what he initially designated as “Bizarro cartoonists”. Are both male? Bizarro also will sometimes include a small drawing of a flying saucer. You can tell how many “hidden” figures are included by looking at the number just above Piraro’s signature (in this case, 3). Forgot to comment on the comic. This is not just a self-portrait of a person who doesn’t know who they are. It’s a memorial. The irony lies in it being erected in memory of something that can’t be remembered, or in memory of something already forgotten. That it’s also a self-portrait is just another layer of absurdity. Any woman stylish enough to rock those trousers wouldn’t be caught dead in those shoes. I kid. Dan Piraro and Wayne Howath are the authors. Draw your own conclusions as to their gender. According to Wiki, these are the random items hidden in the strips. The number above Piraro’s signature (3, in this one) indicates how many are hidden in a strip. As for the comic, this is not just a self-portrait of a person who doesn’t know who they are. It’s a memorial. The irony lies in it being erected in memory of something that can’t be remembered, or in memory of something already forgotten. That it’s also a self-portrait is just another layer of absurdity. Bizarro comics are drawn by Dan Piraro. It’s an assumption that “Dan” is a man, but based on naming conventions it’s more likely to be accurate than inaccurate. The shoes and trousers of the statue are a style more likely found in men’s clothes than women’s clothes, so the subject is either a man or a very “butch” woman (or non-binary person). Based on standard gender signaling and symbolic short hand in comics, assuming that it depicts a man is more likely to be accurate than inaccurate. However, it is interesting to point out and reflect on how we’re perceiving gender signalling. One thing everyone seems to have missed is the talk bubble I hear it’s a self portrait, thus leaving the interpretation open to each viewer. John Morales, it may be “meh” to you, but I guess you are wanting a laugh out loud moment. Good cartooning, like all good art, can lead the receiver in to thought. OT -- Why is it always the man who speaks? I’ve forgotten what I was going to say. Roj, pretty much. Can’t expect continuing excellence at drollery over a very long time; I have the same reaction to quite a number of xkcd and SMBC cartoons, too. There are still the odd gems, so that’s good. Impressive, even, given their longevity. Good cartooning, like all good art, can lead the receiver in to thought. Sure. But ‘can’ is not the same as ‘will’. It’s a bonus, not an expectation. Lofty, at least you didn’t forget you were going to say something.